Welcome fellow South African enthusiasts! This is a basic guide on how to select a speaker, no matter if you are building from scratch or hunting for an upgrade or replacement. Many great drivers are on the market which can really make a selection tough, here are some key factors you need to consider. When selecting drivers we have some fantastic information provided to us called Ts parameters and we can use it to our advantage. Xmax - how far the driver moves forward or backwards from the point of rest. In general most of the brands we provide are providing an accurate measurement of the potential Xmax, take care when brands quote very high levels and for reference most pro audio 18" subwoofer will range between 4.5mm to 12mm with the exception of some premium drivers. Xmax is a big player when it boils down to making bass, this region of the audio spectrum has a very long wave length and by having large amounts of excursion helps in this regard. Though large Xmax values have big problems and the primary drawback is Distortion, one can almost think of a speaker driver as a distortion meter as it moves further in any direction its enemy is distortion as it becomes less linear and Bl starts to drop off and becomes weaker with less control over the cone. Not all drivers are created equal when it comes to displacement, even when using the same mathematical formula to obtain an Xmax value - some drivers retain Bl very well beyond normal displacement and other drivers fall short very early. Xvar is another measurement used to help determine driver characteristics of the driver though I would not highlight this parameter if you are reading this blog as a "Newbie" A final note linear displacement is considered movement in one direction and peak to peak is the total sum of in both directions. Overall if you are hunting for deep bass extensions large Xmax values can work in your favour, if you are after low distortion a little less displacement might be what you are looking for! Most people sadly fail to understand this term or it is very much overlooked, the first mistake most of us can make that can impact loudness is to not consider sensitivity. Simply put it is a measure of efficiency, power in = loudness out which we make reference to as decibels. Home and car audio drivers range between 86 to around 90 decibels whiles Pa drivers can range between 95 and 100 decibels, though what does it mean and how do you take advantage of this rating? Product (A) is 6 decibels more efficient over product (B) and is 1/4 of the power handling, most people make the mistake and buy on power handling which as we can see wont paint a picture of "How loud" unless you consider sensitivity combined with power handling. We quote the reference efficiency provided by the manufactures, though sometimes the efficiency rating is not in the important parts that matter most to us. An example might be for a given driver which is rated to have an efficiency rating of 98 decibels between 500hz and 2.4khz yet the drivers efficiency between 100hz to 450hz is 94 decibels... OMG is it a good sign or a bad sign and what do you believe? Simple, consider the application and how you can take advantage of the response graph. A good rule is the higher the sensitivity the better, the more power you need to push the driver the more heat you have to deal with and heat = loss of spl which we refer to as power compression. Overall one must consider the drivers sensitivity, range of frequencies you want to make use of within the sensitivity and power handling. Now power handling should be simple, the more watts you have the louder the potential output - right? Well its not that simple..
We know high sensitivity is a good thing and we also know that large amounts of potential power can be our friend but we have failed at considering something which is power compression! As we start to push the driver more and more we have an increase in xmax requirements creating more distortion and heat starts to build up over time as we increase input potential. A good portion of woofers will suffer around 6 decibels of power compression at full power, which means though we worked out speaker (A) at 256 watts can produce 120 decibels we can also say that over time we have the potential to experience a loss of 6 decibels. Now higher power handling can become attractive if we were to consider product (A) had a power handling of 1000 watts, with only 1/3 input we would experience far less power loss and stay closer to our 120 decibel target after a given period of time and doing so potentially at lower Xmax levels. Rms... Aes.. PMPO - Peak, Program?? Without going into to much detail here for first timers, lets kick it off with the big elephants in the room. PMPO = NO! Don't even start to consider the product as this is a highly inflated values that is not considered in "this end of speakers"
Peak Power Handling = I dont like the term and neither should you as it has no indication to the driver actual performance in 99% of most instance's and to be fair one should not really have a driver to this level in anycase. Program power = Is the drivers power handling with a very defined set of rules often restricted to a defined period of operation and failing to meet some of these defined requirements will often result in product failure. Most people in the Diy Market should not worry about program power. Rms = A much better term to indicate potential power handling, the best way to sum up an rms rating for a beginner is go beyond this point and its highly likely something will fail due to heat. We can see the rms value is not the peak of the crest rather it is taken as the means with a peak. Aes is a modern standard, we often get asked which is better Rms or Aes and the answer is neither. The advantage of working with a drivers Aes power handling is we consider the lowest impedance the amplifier will see from the driver, if we know a amplifier can do 100 watts rms into 8 ohms but can see a lower potential of lets say 6 ohms our amplifier can potentially output more watts. Aes really helps define loudness and further separates the truth from the lies about sensitivity and just how loud the speaker is, its within our personal opinion that Aes is a great standard and here is why. 2.83 volts with a load of 8 ohms will produce roughly 1 watt of input power producing a given sensitivity rating for our speaker as an example of 95 decibels. Now what if our speaker rated at 8 ohms produces its lowest impedance actually around 5.5 ohms? 2.83 volts into 5.3 ohms = 1.5 watts... which means our speaker does not have a sensitivity of 95 decibels! So when we compare and measure 2 almost identical products side by side in an A/B test we can actual loudness and what load the amplifier will work with. Aes is a great standard when you consider going pro and is adopted not just by speaker manufactures but also by the recording and broadcasting industry to regulate and obtain better standards. For a beginner or a user wanting to upgrade / replace drivers, don't focus on to much detail here as the sum of many parameters will be a larger factor to finding the right product. At this stage you should have a basic understanding about Sensitivity, Power handling and linear displacement or Xmax of the driver. Also abbreviated as Fs which is the drivers natural resonant frequency, think of the Free air resonance as a stop block in the low end response. The driver wants to be at this frequency and for this reference lets use a value of 40hz, at this frequency we have the largest resistance the amplifier will see and it can take large amounts of power to dominate a speakers performance near and below this point. We had a Zmin rating of our previous example at 5.3 ohms however now we can see super high impedance way above 100 ohms. With this impedance we are producing hardly any current and a tiny 0.05 watts, which means we need incredible amounts of power of power to overcome the resistance at the drivers Fs. A good tip is a speaker driver will play great to around 10hz above the drivers free air resonance. 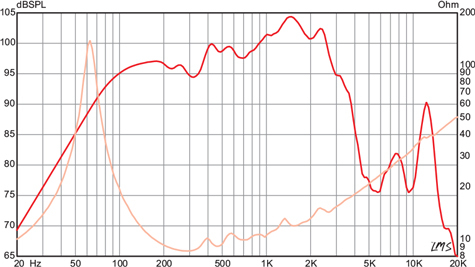 So when hunting for "Deep" bass extensions generally speaking you want a lower resonance product and because the wavelength of bass is so long in this range a high Xmax is a good idea for high levels of output power. Take all of this in, consider reading it over a couple of times and get ready for part 2 as we define further paramters to help us build some great gear!